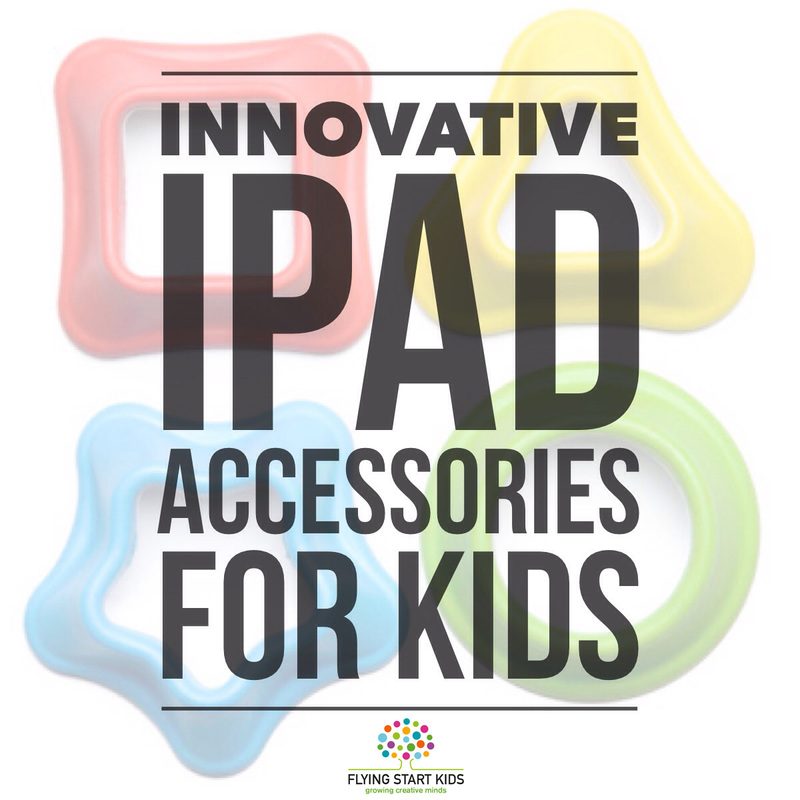 iPad Accessories for Learning and Fun: Review plus GIVEAWAY!! Recently I’ve been interested in exploring new ways of interacting with the iPad, seeing how we can move beyond finger to screen interactions and integrate more 3D real world into our regular iPad experience. I was encouraged in this direction by my discovery of Crayola Digitools and soon I discovered there are a number of fabulous 3D resources out there. Each of the products reviewed below is designed to be used with the iPad to enhance our kids’ enjoyment of learning and inspire creative endeavors. Variety is the spice of life right? And a little, no actually a lot, of variety always goes down well with the kids, so anything that changes our routines up a bit and inspires the kids to start thinking and experimenting in a new way is always worth investigating. Plus research has shown that children learn faster when they are required to engage their visual, auditory and tactile senses in an activity. I’ve looked at iPad accessories made by three companies at the forefront of creative and educational iPad innovation: Tiggly, Touchtronic and Crayola. And luckily for us the kind folks at each of these companies has offered Flying Start Kids readers a chance to win some of these fantastic sets for free! Details at the end of the post. 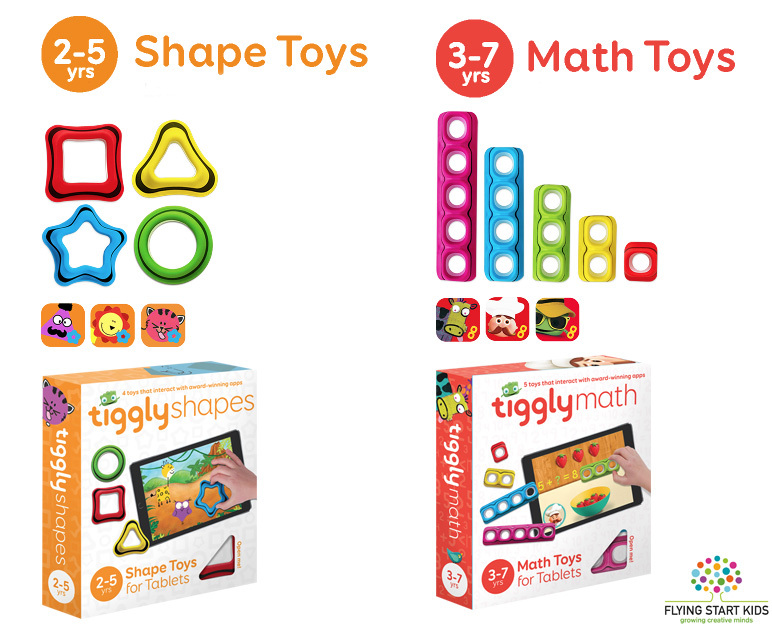 Tiggly Shape and Maths Toys The Tiggly Toys are greatly appealing for little hands right off the bat. Made in beautiful bright colours, they have silicone touch points on the underside, so your tablet reacts to them just like your fingertips. No batteries or Wifi needed. Each set is designed to work with three apps which are available to download for free on the iTunes store. My boys have great fun using these, with my youngest Mr 2.5 saying just this morning ‘I want my Tiggly’s!’ He loves the Shape set and the three apps: Tiggly Safari, which works on Shape recognition, Tiggly Stamp which explores Storytelling and Tiggly Draw where they can make funny animated shape creatures. Each set seeks to help kids develop multiple skills including: fine motor skills, hand-eye coordination, early literacy, spatial awareness, flexible thinking as well as inspire the all important curiosity of ‘What if…’ style thinking. These toys are thoughtfully designed and have won a number of awards including Child Magazine’s Creative Play of the Year Award 2014. An excellent option if you’re looking for a quality educational iPad activity that you can feel good about giving the kids, that really straddle the worlds of education and play. 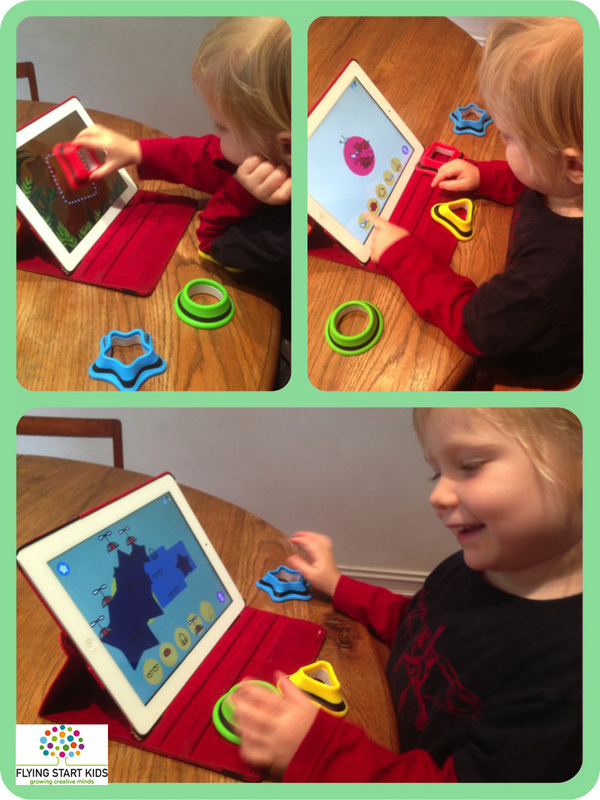 The Shapes set is pitched just right for Mr 2.5, with pace of the progression of skills and learning meaning he is challenged but also knows what is required so he can work out the solutions himself. He particularly likes Tiggly Safari, making animals from just one shape to begin with then progressing to using multiple shapes to make more complex designs. 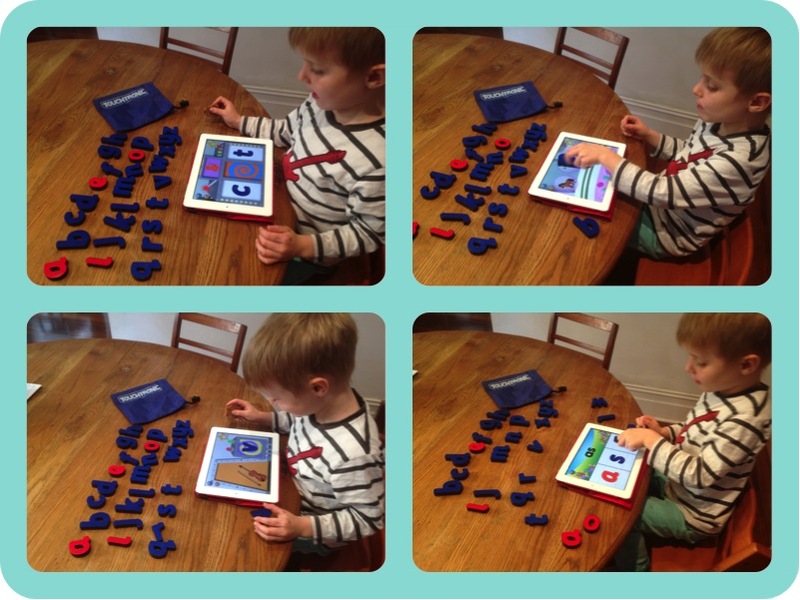 The Tiggly Math set is aimed at older kids 3-7 but Mr 2.5 still had fun playing with this set too, particularly with the Tiggly Chef app which encourages counting skills whilst helping chef make a meal. Mr 5 however really got to grips with them and the Addventure app helped him explore number skipping – counting in 2’s or 3’s etc, which was a challenging concept for him. Also available is the Cardtoons app where counting is experienced through imaginative stories. All these apps help develop counting, addition, numbersense and problem solving skills in a very fun way that my kids enjoyed. 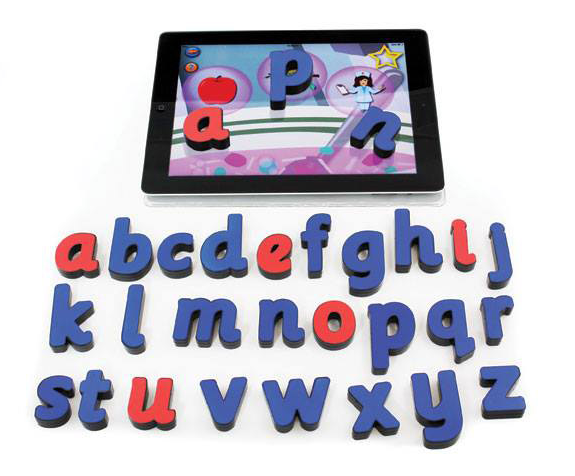 Touchtronic Letters This set of 26 letters colour-coded letters, with consonants in blue and vowels in red was an instant source of curiosity for the kids. We downloaded the two free apps – Touchtronic ABC’s and Touchtronic LetterWords and began to play, the apps being easy and intuitive to use. Our biggest challenge was not losing the letters as the kids started grabbing them with great eagerness and putting them back somewhere randomly. We soon had to devise a method of keeping things in order so play could be maintained. However the enthusiasm with which they were used was lovely to see! We laid them out on the table as in the picture above and made a rule that they had to be replaced in the same spot once used. This activity in itself was great for reinforcing the order of letters in the alphabet and Mr 2.5 got a lot out of helping Mr 5 put them in the right order. Mr 5 was immediately struck by the different colours of the consonants and vowels which led to some good conversations. The apps aim to teach letter recognition, phonemic awareness and word building and can be set with either American or British accents. 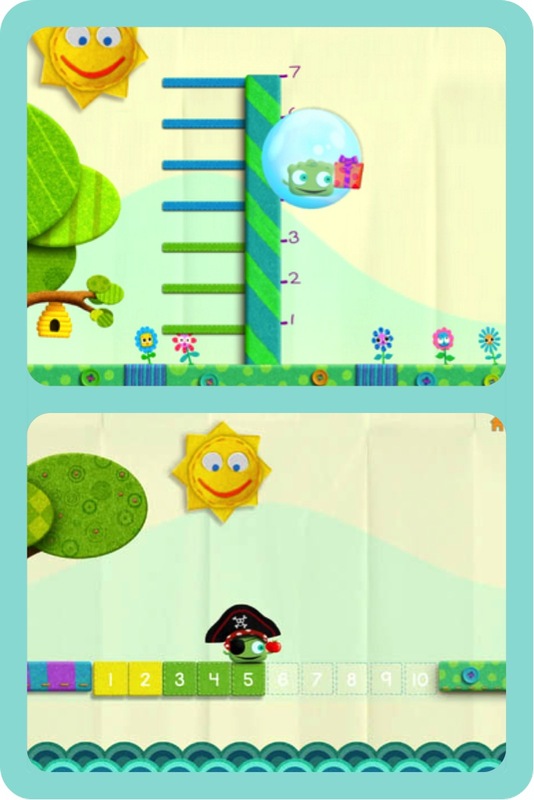 The Touchtronic ABCs app has three games: Mystery Door – the most basic of the games where children unlock the mystery door by placing a letter on the scanner, Eg “S is for snail sss, sss, sss.” Suitable for age 3+ Letter Bubbles – where children pop bubbles by matching the correct letter. Suitable for age 4+ Word Machine – a more challenging game where children place letters on the machine to fill in missing letters in order to spell simple words Suitable for age 5+ Touchtronic Letter Words This is the second app available which focuses on reading, phonics and spelling. 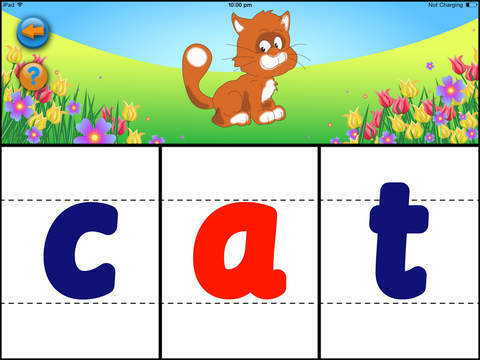 Kids create simple 3 letter words by placing chosen letters in the three available squares. Being the proud mother of a 5 year old it didn’t surprise me too much that once he cottoned on to the fact that he could spell slightly rude words that Mr 5’s enthusiasm for this app shot right up. Kudos to Touchtronic for including the word ‘loo’ in the available vocabulary. Cue many giggles but also concerted efforts at spelling words out phonetically so he could try them out on the app. Encouragingly ‘loo’ progressed into many other 3 letter words which were not toilet related. I also liked how much trial and error went in the experimenting with this app on Mr 5’s part. Sometimes he just played with putting random letters together and then was happily surprised when it spelt a word, accidentally encouraging reading and widening vocabulary too! Crayola Color Alive My first foray into iPad accessories was through discovering Crayola Digitools. These are sets of real world brushes, rollers and markers that work with the an app on the iPad to produce fun special effects when drawing. However Crayola are discontinuing this line in favour of their fab new invention: Color Alive. Crayola have launched a series of colouring books that interact with an app they have available in both the Apple App Store and Google Play (for Android devices). There are 4 different titles including Skylanders, Barbie and Enchanted Forest. We had a play with the Mythical Creatures book, full of dragons and wizards and monsters. All you need to do is download the Crayola Color Alive app, choose your book and start to play. Each book has 7 markers for the kids to colour in with. Once you start to colour in a picture, you can scan your drawing and watch the magic happen. Place the app and camera over your drawing and choose between Special Effects and 4D Play (1). Special effects will add effects to your colours, like making yellow sparkle like gold or red turn to fiery flames. 4D Play turns your 2 dimensional dragon into a living beast, flapping his wings (2). Any part of the dragon you have coloured in will show as such, uncoloured parts will appear white. Once the page comes alive, you can move away from the page and view your device to see the character from any angle (3). Tap the character to animate it or pinch/zoom to resize it. It’s here where you can really have some fun. Playing with colours and watching them come to life. Children will enjoy the process of how a colour on a flat page can turn into a living thing. Well, virtually. Which brings us to our GIVEAWAY!! We are fortunate to be able to offer sets from each of the companies mentioned to some lucky Flying Start Kids Readers. Please note that due to postage restrictions, each set is open to limited parts of the globe, so to avoid disappointment please make sure you are entering for the set available in your home location. On offer are: 1 set of Tiggly Math Shapes open to residents of North America only 1 set of Touchtronic Letters open to residents of USA, UK, NZ and Aus 2 packs Crayola Color Alive – Mythical Creatures open to residents of Aus only To enter, first like Flying Start Kids on Facebook, then please comment below and let us know your favourite app for kids 5-10 years. Make sure to include a contact email address. If you would prefer to keep your email address private you can just comment below and also send me an email to: jessicaATflyingstartkids.com (obviously replace the AT with @. Writing it like that stops spambots finding my address online and sending me junk! You might like to write yours like that too if you are including it in your comment below). Good Luck! Competition closes August 22nd 2015. Winners will be chosen at random and notified by email. DISCLOSURE: Products mentioned in this article were sent to me for review, however all opinions are my own. I would love to win the set of Touchtronuc Letters, I am in the UK. My kids love the Monument Valley app. Thanks! The colour alive app is awesome dude. My dragon and purple octopus came alive on the kitchen table. Thankyou for the three headed dragon. My kindergarten students love the Tiggly Addventure app! They figured out they could use fingers to imitate the blocks! I’d love the touch tonic letters (aust). My five year old was having great fun with ABC reading eggs but it’s lost its charm a little! Having tactile pieces would keep him interested longer and he’s ready for that next step. Ive got 2 boys who would love to play with this app. I like how it apps are becoming more tactile and moving beyond the screen. What next?! I would love to win any of these amazing looking apps, especially the reading and phonics focused ones. I know my 5 year old would be very interested in what else he can do with the iPad. We live in the UK. I have 3yr old with ASD who is obsessed with numbers, letters, shapes and colours, digital and non-digital alike! He has been able to count and identify numbers, shapes and letters since he was 2. So at the age of 3, it is a real challenge finding exercises that keep him engaged, that arnt too easy for him.